Back in 1927: Young gentleman S.C. van Ravenswaaij established his first company. A couple of years later, his five sons joined him in the little warehouse. 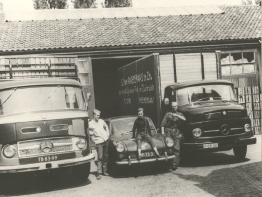 In the course of working decades in their father´s company, the brothers managed to expand the business into a succesfull enterprise, which is one of the leading wholesalers in fruit and vegetables of The Netherlands! The birth of a special company: Ravex Int. However, one son: Paul, thought of the excellent idea to establish an import and export company, Ravex Int. was born! Together with miss Lilia Trutnyeva and a whole team of skilled employees, mr Paul managed to expand the business of Ravex Int into a leading company at a high international level.